Carole writes: It’s a long one! Husband and I have iPhones 4s and one shared Apple ID because I wanted to sync calendars. But it’s proving awkward as some apps won’t share, e.g. Find My Friends, which won’t let me find husband because it thinks we are the same people. Would it be better if he had his own Apple ID? And if so how would I be able to share calendar events and update contacts without him having ALL my contacts. Many thanks! Hi Carole! As I’m sure you’re (painfully) aware, it’s taken years for Apple to get its act together when it comes to iCloud, Apple IDs and family sharing. 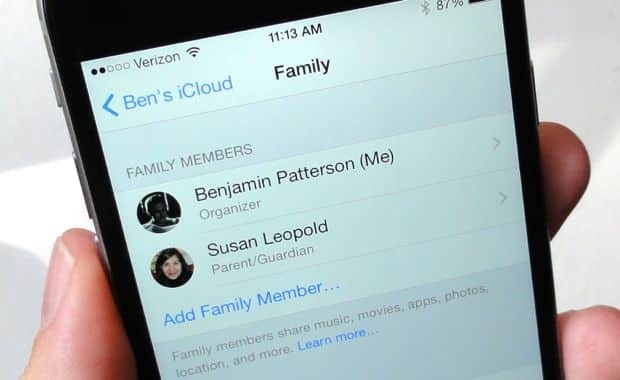 Until recently, there was no concept of a “family” account in iCloud, which meant couples had to resort to elaborate workarounds to share their iCloud content. Luckily, the just-released iOS 8 at last adds “Family Sharing,” which lets family members share purchased apps, music, videos, and (to an extent) calendars and photos. And yes—once you and your husband are using separate Apple IDs through Family Sharing, Find My Friends will (finally!) work properly. But depending on how you want iCloud to work for you and your husband, Family Sharing may not be right for you. Now, I could set up iPhoto on a separate user account on my Mac and back up my wife’s Photo Stream that way, or she can (and does) post specific photos from her iPhone to our shared “Family” Photo Stream. But you can see how complicated dealing with iCloud and Family Sharing can get, right? And here’s something else to consider: while iOS 8’s Family Sharing feature includes a shared “Family” Calendar, you can’t share contacts. Again, if you’d actually rather not share contacts, that might not be a problem; also, if you do decide to switch from one shared Apple ID to two, you’ll get the option to keep the existing contacts on your iPhone and/or iPad and merge them with your new iCloud account. But if you and your husband do want a shared pool of contacts, Family Sharing might not work for you. OK, so say you’ve decided to give Family Sharing a try. What now? First, you’ll need to update both your iPhones to iOS 8—and you may want to think twice about that, given some of the complaints iPhone 4S users have had about the latest version of iOS. Here’s a detailed article that explains what might happen if you upgrade your older 4S model to the new iOS. Next, you’ll need to decide who’s the one who’s going to get a new iCloud account—your husband, say. In that case, he’ll need to sign out of your iCloud account on his iPhone and sign into his new one (or create a new Apple ID directly on his device). You should then decide who will have the “main” iCloud account. If it’s you, Carole, go ahead and tap Settings, iCloud, then tap “Set Up Family Sharing.” Type in your husband’s new iCloud e-mail address, follow the prompts, and he’ll be added as a family member under your iCloud account. Once that’s done, you and your husband will be sharing apps, videos and music you’ve bought from iTunes and the App Store, but you’ll have your own contacts, your own Safari bookmarks (my wife and I are pretty happy about that), and you’ll be able to track each other (or not, if you choose) using Find My Friends. Sorry for the long answer, Carole, but that’s iCloud for you. Still have questions? Let me know! iPhone tip: Why are my husband’s apps showing up on my iPhone?